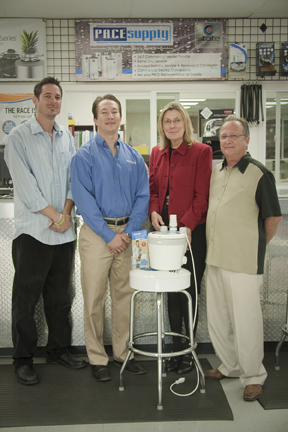 For the Media: PACE Supply invests in employee and customer product training; drives growth. Northern California wholesaler PACE Supply invests in employee and customer product training and uses these educational efforts as a driver for growth. SANTA ROSA, CALIFORNIA (NOVEMBER 9, 2009) — Conventional wisdom holds that if you give a man a fish, he eats for a day, while teaching a man to fish means he eats for a lifetime. The debate has always been does this same educational approach work in the world of business: Do investments in training deliver long-term results in terms of increased sales? In Santa Rosa, California plumbing and HVAC wholesaler PACE Supply is answering that question with a resounding yes. Founded in 1994, the employee-owned company has grown to 12 locations throughout northern California. From its founding the company’s mission has been to create an environment that enhances the quality of life for its team members through a commitment to education. “Team members“ at PACE, of course, includes not only those employed within the organization, but also its customers, vendors and reps. And why not? The education value equation benefits each and every one of them. Business builder: Education has been the vehicle to create new business for PACE and vendor partners like SFA Saniflo Inc. despite the economic slowdown. A manufacturer of a complete line of macerating toilet systems and gray water pumping systems for residential and commercial applications, Saniflo offers a specialty product solves complicated and costly remodeling problems. Rather than bust up a concrete floor to add a basement or below-grade bathroom, Saniflo’s above-floor plumbing systems makes it possible to install a complete bathroom on top of a finished floor virtually anywhere in a structure—with no need for digging to create drainage connections. In areas with an older housing stock as well as smaller office and retail spaces, such as in cities like San Francisco and Oakland, the need for this solution is great. But contractors and their customers need to be informed and educated on all the possibilities—residential, commercial and institutional. Field Market Summit: Suppliers are invited to this annual event to tell the product story. Each manufacturer explains the technical side7mdash;how its products work and install—as well as answering the value questions that equip PACE personnel with the selling features and product benefits. 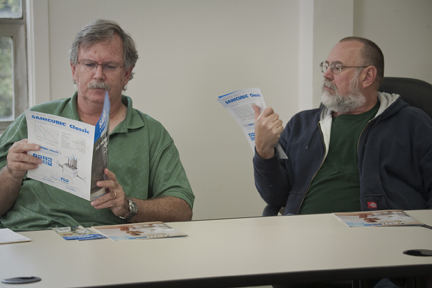 For a solutions-oriented product like Saniflo, conducting an in-depth orientation to its line for the sales staff at PACE benefits both organizations. “Our salespeople become a better resource for our customers, and the Saniflo story gets told to potential clients who didn’t know the technology existed to solve their plumbing problem,“ explains Nitzberg. SFA SANIFLO INC. is the only manufacturer of its kind in North America, offering a complete line of macerating toilet systems and gray water pumping systems for residential and commercial applications. 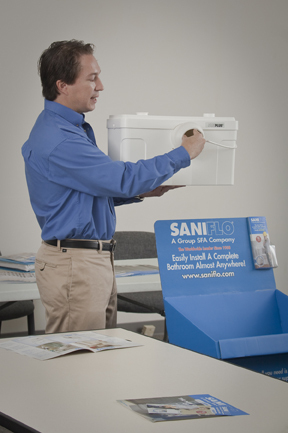 Saniflo markets through independent sales agents throughout North America, and the product line is currently available at distributor and dealer locations throughout the United States and Canada. 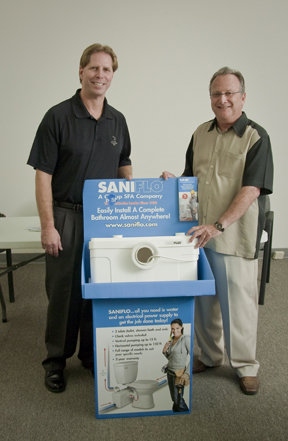 For more information about SANIFLO, call toll-free at 1-800-571-8191; visit the Saniflo website at www.saniflo.com. To download a hi-res image file, click on the desired image and a zip archive automatically downloads to your computer. Due to how various browers handle downloads, you may have to expand the zip archive manually. Images are 6" wide x 4" high x 300 ppi (1800 x 1200 pixels); CMYK; unless otherwise specified. 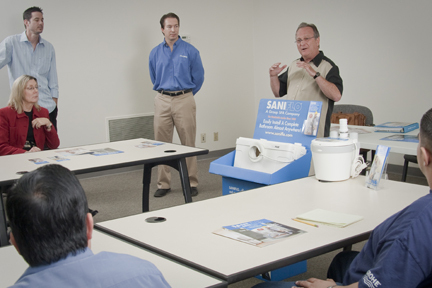 For a solution-oriented product like Saniflo, conducting an in-depth orientation to its line for PACE Supply customers benefits both organizations, says vice president/business development Barry Nitzberg at a recent class. 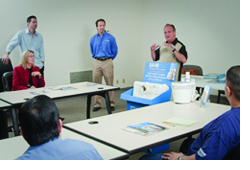 Training the staff at PACE Supply and working with PACE to train it’s customers ensures we capture the market by providing an extra, independent resource for consumers who have unique plumbing installation problems explains Saniflo western regional sales manager Chris Peterson. PACE vice president/business development Barry Nitzberg (FAR RIGHT) WITH (FROM LEFT) Saniflo rep Jeff Gagnon of DCS Pacific, SANIFLO WESTERN REGIONAL SALES MANAGER CHRIS PETERSON AND PACE training coordinator Aletia Sexton. Working with PACE Supply to train its customers ensures we capture the market by providing an extra, independent resource for consumers who have unique plumbing installation problems says Saniflo western regional sales manager Chris Peterson. The expertise and advice from PACE employees who are well-trained creates a level of confidence in end-users that can’t be accomplished by literature and a web site alone says Saniflo western regional sales manager Chris Peterson. 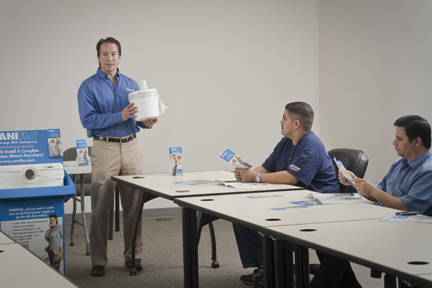 Education takes many forms at PACE Supply – some classroom-based like this session Saniflo staff and reps held recently for PACE Supply customers. 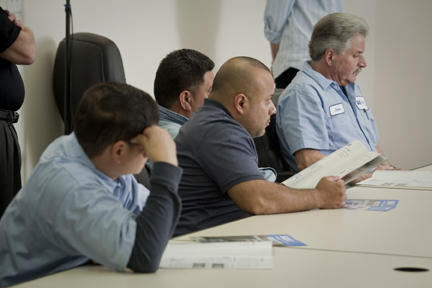 PACE Supply's training efforts fill the knowledge gap that often exist in the marketplace. Sessions like this that explain Saniflo’s above-floor plumbing systems shows how it is possible to install a complete bathroom on top of a finished floor – with no need for digging to create drainage connections. 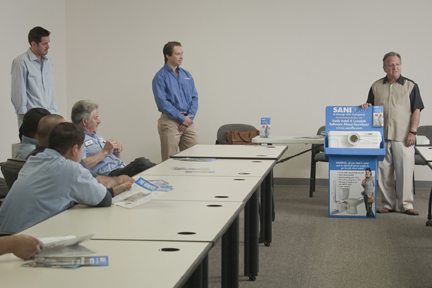 Conducting an in-depth orientation to the Saniflo line for the sales staff at PACE benefits both organizations. 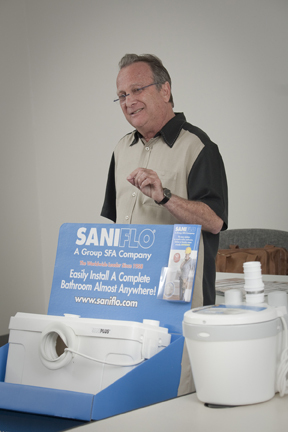 “Our sales people become a better resource for our customers and the Saniflo story gets told to potential clients who didn’t know the technology existed to solve their plumbing problem,” explains vice president/business development Barry Nitzberg. 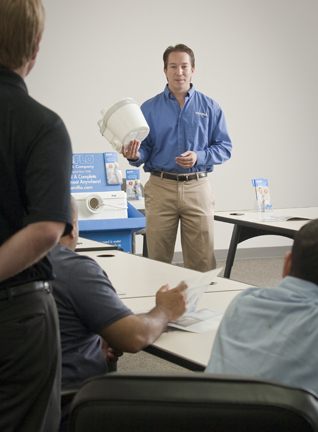 PACE Supply customers follow along as the Saniflo line of macerating toilet systems and gray water pumping systems are explained. 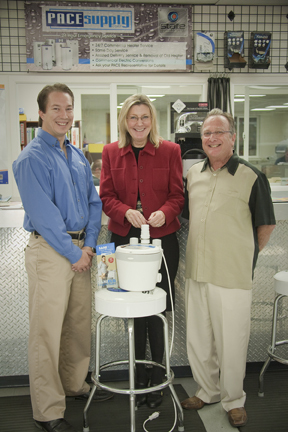 Education is the foundation of our business development plan, says PACE vice president/business development Barry Nitzberg, right, with training coordinator Aletia Sexton and Saniflo western regional sales manager Chris Peterson. PACE vice president/business development Barry Nitzberg (RIGHT) with Marty Outlaw, branch manager at the PACE Supply operation in Oakland, Calif.
Education has been the vehicle to create new business for PACE Supply and its vendor partner Saniflo despite the economic slowdown, says vice president/business development Barry Nitzberg (standing at the display). Saniflo western regional sales manager Chris Peterson says most end-users have a need for Saniflo products, but since its not an impulse buy, many buyers need the reassurance that the technology works and does the job efficiently. Knowledgeable contractors helps build consumer confidence.